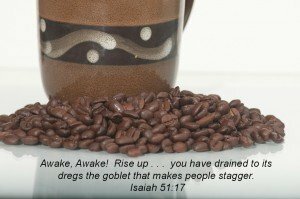 A little humor today from Coffee as a Means of Grace – A sip of theological humor. If you have ever endured an sermon loaded with sloppy exegesis, you’ll find the rest of the article a good laugh. I’ve heard nearly every exegetical mistake picked on in the article and couldn’t help but laugh at the accuracy of the twists and turns. This was a satire job well done. This present work will survey many of the major biblical passages that discuss coffee as a means of grace, as well as a few corroborative arguments from experience5 and even historical theology. Of course, further study needs to be done on coffee as a means of grace, perhaps in future theses or dissertations by more progressive theologians. And although a number of passages could be piled one on top of the other to establish beyond a reasonable doubt that coffee is to be recognized as a legitimate means of grace, this paper will focus on a few key Scriptures first from the Old Testament and then from the New. Read more from: Coffee as a Means of Grace – A sip of theological humor.